Whenever you want to know something about Islam you should start reading one of the best sellers of British author and religion analyst Karen Armstrong, such as Muhammad: A Prophet for Our Time, Islam: A Short History or A History of God. Where too many profesors focus on irrelevant details of history, Karen Armstrong combines her helicopter perspective of religions with the picking of detailed research from the roots. She is the master of getting the puzzle of truth together and giving us the greater picture and the directions of religious leaders. The former Catholic nun, later teacher and now writer digs out the common peaceful roots of religions and the authentic voice of Islam. In 2008 she was awarded the Freedom of Worship Award of the Roosevelt Institute and the TED Prize in New York. 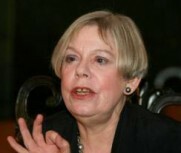 More information about Karen Armstrong can be found here.